Messenger has become one of the most powerful communication apps of all time. Boasting over one billion monthly active users there is a good chance your target audience is not only on Messenger but using it every day. There is lots that can be done with Messenger and this platform has only just open for business. If you would like to speak to a Messenger marketing expert then simply fill the form our provided and one of our team members will be in touch. Build automated responses to deal with customers, pre-qualify leads and drive sales. Build Messenger lists (just like an email list) and send broadcasts to your followers. So How Exactly Can Messenger Help Your Business? Messenger have allocated a place on the home screen of their app for ads to appear. This ‘ad placement’ can be bolted-on to your existing Facebook advertising campaigns and used as another way to get in front of your target audience. This means you can use it drive awareness, get people to visit your website, download an app or purchase from your online store, just like you would any other ad. The good thing is, you don’t need to change any ad creative or set up anything new, it’s just another benefit of advertising in the Facebook network. We’ve set up many Messenger ads before and would love to help you get this going for your business. 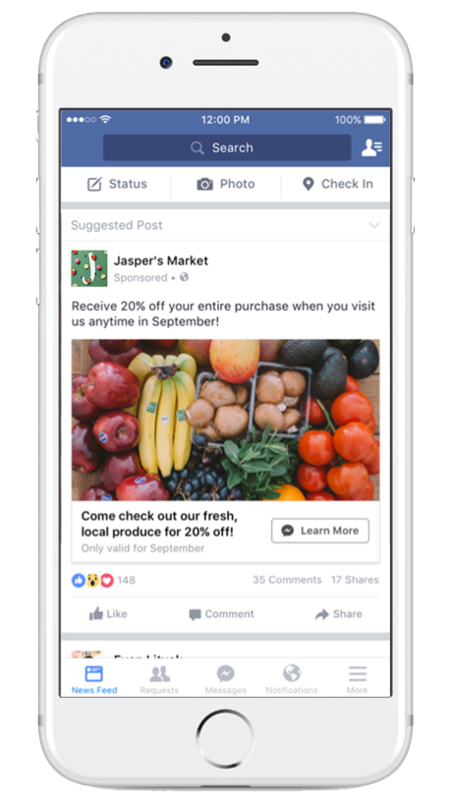 ‘Message’ can now be used as a call-to-action on your adverts inside of Facebook. This means when your target customers see your advert in their newsfeed they can now click the call-to-action, their Messenger app will open up and you can begin a conversation with them. This type of advert is a great way to ‘build your Messenger list’, get someone to interact with your ‘Messenger Bot’ or simply have your customer services team deal with the enquiries. Click to Messenger ads are very popular for lead generation and customer services. They offer a very easy method for potential customers to get in touch and start engaging with your business. The great thing is you can use these in your existing Facebook or Instagram advertising campaigns. The same in-depth targeting, sophisticated ad creative and clever engagement techniques can all be applied to Messenger ads to grow your business. A Messenger ChatBot is an automated tool that can interact with your prospects or customers on your behalf. 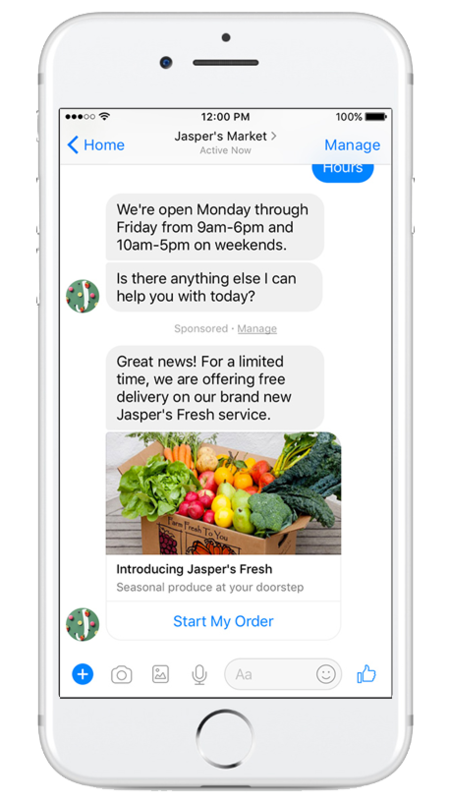 Messenger Bots are incredibly powerful and can be used in lots of different ways to help you grow your business. Tracking a Bots interaction also means you can work on the ‘flow’ of how your prospects use the Bot. Through analytics, tweaks can be made to improve the Bots complexity and performance so it can drive more results for your business. 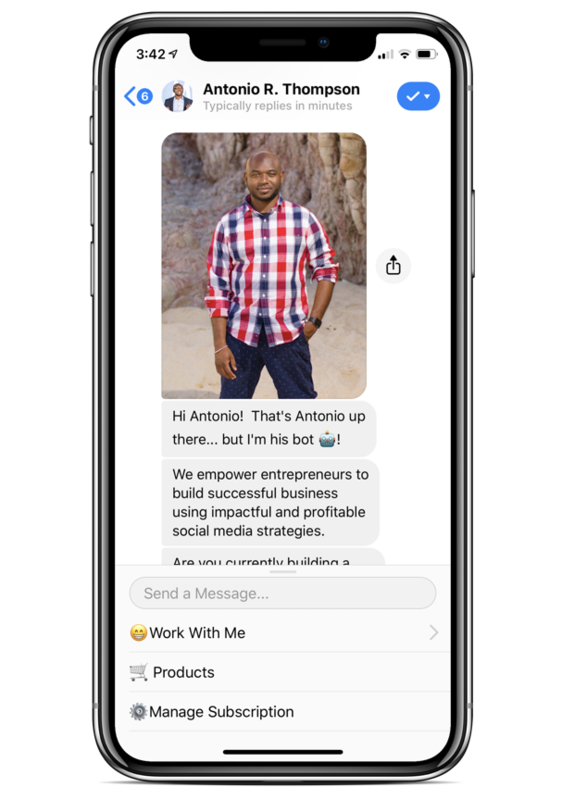 We can help you to build and deploy a Messenger Bot. Monitor the interactions of the Bot and improve the Bot over time. Just like with your email list you can now build a messenger list and broadcast out messages to your subscribers. Messenger Broadcasting is one of the most exciting developments in Messenger Marketing. On average Messenger is boasting an incredible 80% open rates on broadcasting and 4x (or even 10x) click through rates compared to email marketing. For most businesses email marketing is incredibly powerful, well now the same tactics can be deployed on Messenger will even better results. There are many ways that you can use Messenger Broadcasting to grow your business. We can help you build your messenger lists and broadcast out messages to fulfil your businesses KPI’s. If you’re interested in finding out more about how we can help you with Messenger Marketing click here to schedule a time to chat. We’re always happy to discuss Facebook strategies, review ad accounts or having good conversations with businesses looking to make progress.